People often ask where I get my ideas from so I thought I’d share with you today what inspires my work. Inspiration comes from so many places but sometimes it takes me a while to see it. There are days where I feel very stuck and my brain gets very closed off. Pete said to me once that being stuck is a good thing; it’s where your brain starts to make new connections and ultimately moves you forward a step as you work your way out of it. I take comfort in that. A quick break from my work room or home can make all the difference. And once my head clears, the ideas flow through and I realise I had it all along. I don’t look at work by other designers and I don’t tend to jump on trends, mainly because I want my work to be original and by following my own path, my own style has evolved to become something more readily recognisable and desired. First of all, there’s nature. There’s the colours and shapes of the flowers, the shapes of the leaves…but more than anything, the way that nature inspires my work is in the way branches and twigs are entwined and the details that come off them. Another source of inspiration comes from the Art Deco period, and this certainly came through more in some of the designs for the Inspired Collection. I find that this style tends to feature more when I’m working with heavier metallic details, like vintage brooches. The structure and patterns appeal to me and it’s a contrast to my more delicate work. The details on dresses are another thing that inspires my work. This year we’re seeing a lot more detail on dresses and capturing those elements with beads and crystals is a way that I can coordinate your accessory with your dress. I’ve taken inspiration from the patterns on lace to create details on hair vines and around brooch bouquets; it’s a small detail that will mean something to you and shows the thought that has gone in to creating your design. A few of my latest pieces were designed to compliment Galina Hnaticova’s new dress collection, which is so beautifully detailed. The materials I’m using also play a big part in the style of the final piece. Again, particularly so when using pieces of vintage jewellery because I like to work with the details that are there so the finished piece looks right as a whole. Sitting at my desk with different colour combinations often helps me to visualise something. I make rough sketches of ideas but it’s through trying out different things and seeing what I can do with the wire and how I can balance out details that my accessories really take shape. Finally, and possibly my most favourite source of inspiration, is you! Each of us are so unique and, when we meet, I pick up on things that you say that I can incorporate into your accessory. It might be a story about a piece of jewellery your mum had, or a comment about your favourite flowers. Everyone’s sparkle is so different but shines the same, so capturing that in your accessory is both a challenge and an absolute pleasure. It’s the biggest thing that contributes to the feeling of being stuck; but once I get through that, magic happens. 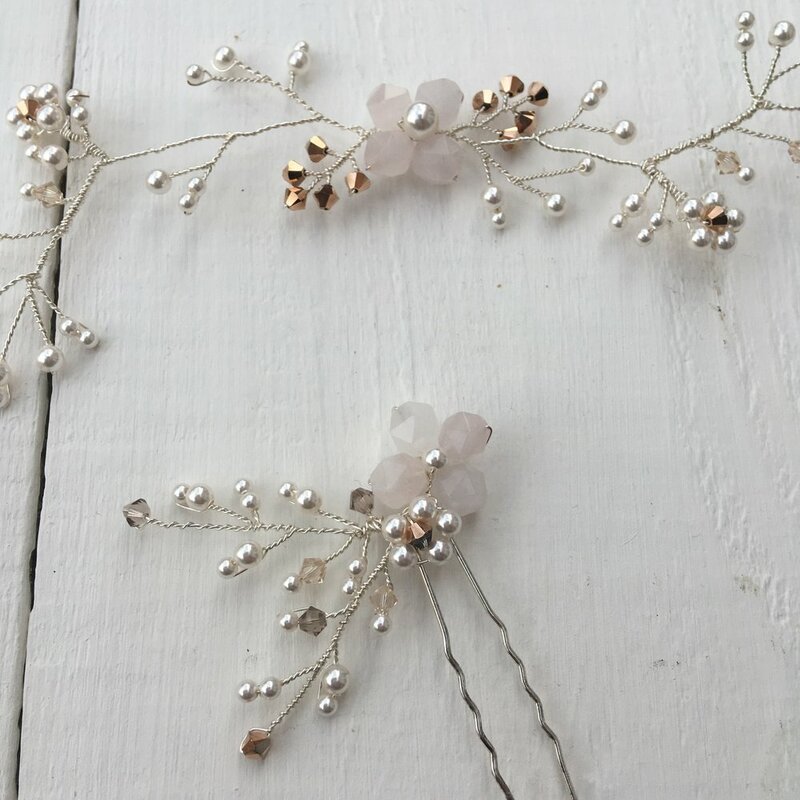 If you’ve been thinking of making a hair piece for your wedding, I hope this gives you some ideas of where you could take inspiration from, but if you’d like a little extra help to get you started, why not treat yourself to one of my workshop sessions and I’ll help you to create something really special? Let me know your preferred date, time and location and I’ll be in touch!